A black and white postcard of 67 Baldwin Street. 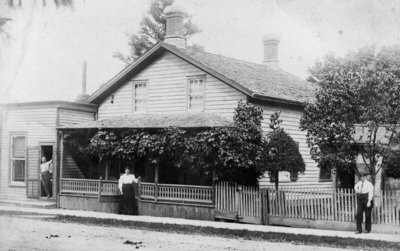 This house stood on the east side of Baldwin Street, south of the present day pharmacy, and was demolished in March of 1960. This is likely Mr. Duncan's residence. He is listed as a tailor in Brooklin in a directory of 1902. Back, rubber stamped inscription, "B. Duncan, Merchant Tailor, Brooklin, Ont." 67 Baldwin Street, c. 1907, Photographer Unknown. Whitby Archives P2013_002_001.